We just returned from a 2 week road trip to Jackson Hole, the Grand Tetons, Yellowstone, Little big Horn, Mt. Rushmore, the Crazy Horse Monument and much, much more. I was able to fit in a little plein air work-though not nearly as much as I would have liked. We took loads of photos and I hope to find some inspiration in a few of them for future paintings. My favorite part of the trip was Yellowstone's enormous variety of geothermal features-every one so different and curiously beautiful in its own way. My least favorite thing was Mt. Rushmore....Yes it's a great engineering feat, but in my mind, it's one step up from the World's Biggest Ball of String! 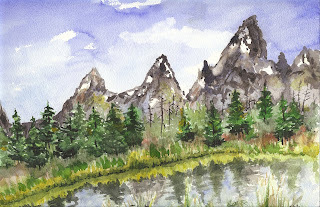 This painting was the first one I did-hope you can recognize the Grand Tetons. I was sitting on a termite-infested log beside a beautiful little river on a perfect 75 degree day. This painting includes 2 of my biggest challenges-water and layers of foliage.